It's a lesson oft repeated in history. Illustration shows Julius Caesar or a Roman centurion, in the background, tumbling off a pillar of stones labeled "Rome, Etruria, Britain, Asia, [and] Africa", and in the middle distance, on a bit of land labeled "France", Napoleon I tumbling off a pillar of stones labeled "Egypt, Italy, Spain, Holland, Austria, Prussia, [and] Russia" and falling toward a rocky island labeled "St. Helena". 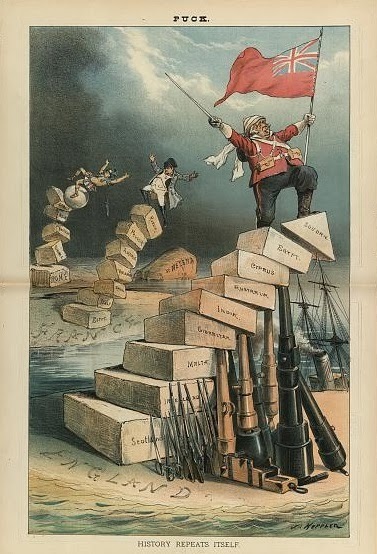 In the foreground, John Bull is standing atop a pillar of stones labeled "Scotland, Ireland, Malta, Gibraltar, India, Australia, Cyprus, Egypt, [and] Soudan [sic]" on a bit of land labeled "England"; the stones are propped up by various types of weapons, with the top two stones supported by a steamship, though the top stone "Soudan" appears about to fall off.